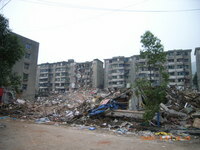 The Asian Disaster Reduction Center (ADRC), in cooperation with the Disaster Reduction and Human Renovation Institution (DRI), investigated ways for the lessons and experiences of the Great Hanshin-Awaji Earthquake with regard to recovery and restoration of disaster-stricken areas to be utilized in response to the Sichuan Province Earthquake that struck Wenchuan County in China's Sichuan Province (GLIDE no. EQ-2008-000062-CHN) on 12 May 2008. To conduct this investigation, ADRC Senior Researchers spent 25-30 May visiting the cities of Dujiangyan and Mianzhu in the disaster-stricken area to assess the situation on the ground and to share nformation with officials from the Sichuan Provincial People's Government, the China Earthquake Administration, and the National Disaster Reduction Center (NDRC) of the Ministry of Civil Affairs.